The southernmost city in the continental United States, Key West features a unique mixture of cultural influences. The colorful history of the four- by two-mile island is filled with tales of poverty and prosperity, death and rebirth. Key West's early economy relied heavily on sponge-fishing and the risky but lucrative "wrecking," where locals salvaged the goods of ships run aground in the shallow waters. The architecture is mainly Caribbean with many houses built out of coral-rock or salvaged ship-boards. Others came directly from the Bahamas, dismantled and shipped then re-assembled here in the Keys. The cuisine is Afro-Caribbean and Spanish and there is a certain tropical, laid-back feel to the town. Key West is known for its sunsets, which draw tourists from all over the U.S. and beyond. Several famous writers have called the island home, including Ernest Hemingway, Robert Frost, and Tennessee Williams. Key West continues to attract artists today with its Bohemian and tolerant atmosphere. 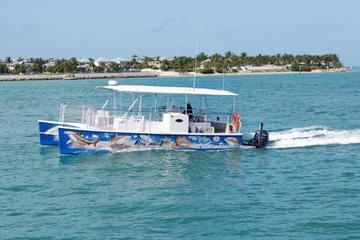 Plan your time here with our list of the top attractions in Key West. Duval Street is Key West's main tourist strip, with restaurants and shops designed to entertain tourists and cruise ship passengers. This is the place to begin, or perhaps end, a day of sightseeing. Historic homes and some of the city's most popular tourist attractions can be found along Duval Street, which stretches from Mallory Square to the Southernmost Point marker. This area is also host to several events and festivals throughout the year, the most famous of which is the Hemingway Days Festival, held each summer. Other highlights in the area include Ripley's Believe It or Not Odditorium and the mecca of everything key lime, Kermit's Key Lime Pie Shop. Tourists can get a good overview of the area and its history on the Conch Tour Train, which visits Duval Street, as well as Old Town, Hemingway's House, and the waterfront area. This 90-minute narrated tour offers perspective on the railroad days, the depression, and WWII, as they relate to Key West. The legendary author Ernest Hemingway bought this 1851 Spanish Colonial house in 1931 and lived in it until 1940. It features a lush tropical garden and the salt-water pool that he claimed nearly wiped him out financially, and contains his "last penny" pressed into the concrete. Tourists can see the restored interior as well, which displays the writer's own collection of 17th- and 18th-century Spanish furniture. More than forty descendants of Hemingway's original brood of house cats still roam the property. He wrote a number of novels here including A Farewell to Arms, Death in the Afternoon, and For Whom the Bell Tolls. Visitors to the Key West Butterfly and Nature Conservatory have the unique opportunity to walk among more than fifty species of butterflies in the natural garden habitat of a glass conservatory. In addition to the colorful butterflies, there are more than 20 species of exotic birds that reside here, making a visit to the conservatory a truly special experience. The Learning Center provides visitors with an educational film about the life cycle of butterflies, and there are also exhibits that explain the stages in detail, as well as a live caterpillar viewing area, where you can see real butterflies going through their transformations. This is a popular tourist attraction for nature-lovers as well as families. Mallory Square, a former warehouse area, is now the location of a nightly sunset-watching ritual with live entertainment. This is one the most popular free things to do in Key West. Tourists gather on the dock to marvel at the stunning pinks and reds as the sun sets over the Gulf of Mexico. Jugglers, vendors, musicians, and other street performers create a carnival-like atmosphere, including some truly unique performances like dog unicycling, cats on a tightrope, and straightjacket escapes. The area has become one of the tourist highlights of Key West, particularly in the late afternoon. There are shops and other attractions located on and around Mallory Square as well, including the historical Key West Sponge Market, a treasure-hunting store, and multiple surf shops. Dry Tortugas National Park is an archipelago of seven reef islands located around 65 miles southwest of Key West. They were so named by explorer Ponce de Leon due to the number of turtles (tortuga meaning turtle in Spanish) found on the islands. The "dry" part was added later, referring to the lack of fresh water on the islands. One of them, Garden Key, is home to the 19th-century Fort Jefferson, which was built by the U.S. government to protect and control the Gulf of Mexico shipping channel. The fort operated as a prison for Union deserters during the Civil War and also housed Dr. Samuel Mudd, who was arrested as a co-conspirator in Abraham Lincoln's assassination. In 1992, George Bush changed the status of the site from the Fort Jefferson National Monument to the current park run by the National Park Service. Soft sand beaches and wonderful opportunities for snorkeling also add to the allure of the park. Catamaran Boat Excursions to the Dry Tortugas, which include snorkeling and snorkeling equipment, as well as lunch, leave from Key West. The Mel Fisher Maritime Museum tells the story of diver Mel Fisher, who discovered several shipwrecks, including one that carried exceedingly valuable artifacts and another that holds a wealth of historical value. First discovered in 1972, an English ship was found about 35 miles west of Key West. Later identified as the Henrietta Marie, this was a slave ship that had disappeared in 1700 shortly after selling 190 African Captives in Jamaica. Although the ship did not carry a wealth of gold and jewels, its remains hold invaluable artifacts, which provide a look at the history and conditions of the maritime slave trade, and is the oldest slave ship wreck to be discovered. In 1980, Fisher's dive teams discovered the wreck of the Santa Margarita, a 17th-century Spanish ship. This wreck held an astounding assortment of valuable objects, from gold and silver bars and coins to elaborate jewelry. The museum displays numerous artifacts from these wrecks and others, including a 77.76 carat emerald and several other rare items such as navigational instruments, tools, and other everyday items. The museum also has exhibits on underwater archaeology and diving, as well as films and hands-on demonstrations. The restored Harry S. Truman Little White House was built in 1890 and served as the headquarters for the naval command through World War II. Truman first visited the house in 1946, and during his presidency used it several times as a vacation retreat. The original furnishings and decor have remained intact from the Truman era, and it has been used by subsequent presidents and officials as it still is today. Visitors can see Truman's piano and the desk he used during his "working vacations," and guides add insight into the building's history and the political significance it held during the Cold War. Tourists will also enjoy a self-guided tour of the home's botanical gardens. The Martello Towers are two brick fortifications, built in 1858 to protect Fort Zachary Taylor from the east. The fort was never completed and never saw hostile action, although the eight-foot-thick granite walls would certainly have withstood artillery attacks. The central tower provides a spectacular panoramic view of the Atlantic coast of Key West. The West Martello Tower and Garden Center was constructed in the 1860s by the U.S. Army Corps of Engineers. The Key West Garden Club took possession of the fort in 1955 and began a cleanup and planting to beautify the dilapidated fort. Today, visitors can stroll the grounds, through lovely courtyards and gardens. Romantic pathways, arches, a waterfall, and water lily pond are some of the highlights. The East Martello Tower was originally built as a complement to Fort Zachary Taylor to protect the region. It now houses the Martello Gallery -Key West Art and Historical Museum, with a diverse collection of local art and sculpture and other exhibits related to the development of Key West. This 1840s home was built by ship carpenters for Captain John Greiger, a noted harbor pilot and wrecker. Colonel Mitchell Wolfson restored it in the 1960s, initiating the subsequent preservation movement in the rest of Key West. The property is noteworthy both for the house and the beautiful gardens and grounds. The home contains many 18th- and 19th-century period furnishings, much of it from Europe, and a substantial collection of engravings by John James Audubon, who stayed here in 1832. The gardens in the back contain a variety of tropical plants, including birds of paradise, hibiscus, and different palms. Visitors are given a guided tour of the Audubon House and then offered the opportunity to explore on their own and take time to appreciate the grounds. Built between 1845 and 1866, Fort Zachary Taylor protected this part of Florida's coast during the Civil War. Today, it is a State Park and National Historic Landmark, renowned for its historical attractions, especially the extensive collection of Civil War era armaments, which are still being excavated. The park also hosts a variety of annual events, including concerts, boat races, sculpture contests, and even a pirate festival. In addition to all of these fun things to do, tourists will enjoy the park's beautiful swimming beach; dedicated snorkeling areas; and nature trails, which are open to both foot and bike traffic. This is also one of the best places to see Key West's famous sunsets, and the beach is a perfect spot for a romantic picnic. The Oldest House in South Florida, built in 1829, was the former home of Francis B. Watlington. It was originally built by Richard Cussans in a different location and later moved to Duval Street. The house offers a chance to see and learn a little about the history of Key West. It is not as extravagant or as lovely as some of the city's other historical houses that are open to the public, but it has its own unique charm. Within the house are some original furnishings, family portraits, and displays on the history of Key West. Ship models and information on the history of the industry in the area are on display. At the rear of the house is a garden and a cookhouse, which was typical of the period. There is also an exhibit pavilion containing additional documents of interest. The Key West Aquarium first opened its doors in 1934, making it one of the first open-air aquariums in the U.S. For practical purposes of algae control, a roof was later added, and the facility was upgraded. Exhibits include the "Atlantic Shores" and the large outdoor holding pens. A number of tanks house local marine life, including puffer fish, snappers, and angelfish. There are also tanks with barracuda and sharks, and a "touch tank," which allows visitors to get up close and personal with conch, starfish, and other invertebrates. During the tours, visitors can watch the sharks being fed and touch a juvenile nurse shark. Key West's claim to fame as the southernmost point in the continental U.S. is made concrete in this red, black, and yellow marker at the corner of South and Whitehead streets. Street vendors and performers congregate around the site to sell souvenirs and showcase their talents. The marker itself, dedicated by the Key West public Works Department in 1983, is less than inspiring but nonetheless, visitors often have their picture taken at the marker. A similar landmark and equally popular place for Key West photo-ops is the US1 mile-marker "0" sign which marks the beginning of the route which runs up almost the entirety of the east coast. Stretching for nearly 2,400 miles, the interstate ends in Maine, passing through several major cities. The Shipwreck Treasure Museum is housed in the replica of a 19th-century wrecker's warehouse with exhibits exploring the fascinating history of the salvage industry in the area. Wrecking, the practice of salvaging cargo from the various ships that perished along the Florida reefs, was once a major part of Key West's economy and an extremely lucrative - but dangerous -industry. From atop observation towers like the 65-foot example here at the museum, wreckers would watch day and night for ships in trouble and race to the site. The first to arrive could claim the rights to the largest share of the salvage profits, a process overseen by special "wrecking courts." Here, at the museum, actors in period costume recount the story of the Isaac Allerton, which sank in 1856, as well as show what life was like for the daring wreckers who risked their lives to not only recover treasure but also save the lives of the reefs' victims. Artifacts from the shipwreck are displayed, and visitors can also watch films and videos on the subject. The observation tower provides excellent views and photo opportunities of the surrounding land and seascape. Founded in 1847 after the island's original cemetery was destroyed by a hurricane, the headstones in Key West's cemetery mark the graves of more than 35,000 people. This historic cemetery has several religious and memorial sections, including dedicated Jewish and Roman Catholic areas, the Los Martires de Cuba memorial commemorating the Cuban martyrs who were killed during the 1870s independence movement, and a plot dedicated to the sailors who died when the USS Maine sank in 1898. Many visitors enjoy the intricate iron work and carved monuments that adorn family plots and tombs. The Key West Lighthouse was built in 1847 and opened in 1848 with a female keeper, a rarity in that time. Over the years, its keeper's quarters and lenses were upgraded until technology rendered both obsolete, and it was decommissioned in 1969. The Key West Art and Historical Society adopted the property, initially turning it into a military museum and then later restoring the lighthouse and quarters to reflect life here at the beginning of the 20th century. Today, it houses original furniture, household items, and photos of the many keepers who kept the light burning through even the worst of storms. The lighthouse stands at 86 feet high, and visitors can climb up its 88 steps for great views from the observation deck near the top. A short video presentation also provides an interesting look at the history of the Key West Lighthouse. Key West is compact and easily walkable, but the best place to stay is near Duval Street, in the heart of downtown. Budget-minded travelers will have to search farther afield to find reasonable prices. Luxury Hotels: At the end of Duval Street near Mallory Square, the Ocean Key Resort & Spa features waterfront rooms with balconies and an oceanside pool. Nearby is the lovely Pier House Resort & Spa with a private white-sand beach and a pool overlooking the water. Located just a block off Duval Street, The Gardens Hotel is a beautifully appointed property, with lush gardens surrounding a pool. Mid-Range Hotels: Hotels in this price range tend to be a little farther back from the action but still on the island of Key West. The Chelsea House is a charming boutique hotel housed in two buildings from 1905 and 1891 respectively. The Best Western Hibiscus is in the quieter southern section of Key West. It features a very large pool, by Key West's standards, and is just a short walk to the southernmost point in the United States. A bit farther out, but with a shuttle bus that runs every 20 minutes to Duval Street, is the DoubleTree Grand Key Resort. This hotel is set on large, lush grounds and features renowned tropical gardens. Budget Hotels: The budget options tend to be a bit older and farther out from downtown. The Ibis Bay Beach Resort has a shuttle to downtown and is close to restaurants and grocery stores. Another option, three miles from downtown and featuring beautiful views out over the water, is The Laureate Key West. You'll need a car to stay here as there is no shuttle, and no restaurants are nearby. Sightseeing Trolley: A convenient way to get to and from the top tourist attractions in Key West is the Key West Hop-on/Hop-off Trolley, which makes stops at all of the island's most popular spots, like Mallory Square and Duval Street museums and shops, as well as several museums and landmarks. In addition to making your Key West vacation itinerary a breeze, an expert guide narrates the ride, providing interesting facts and telling fascinating stories about the island's history and lore. 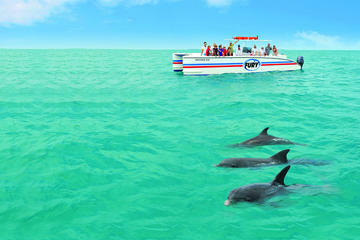 Dolphins and Snorkeling Boat Tour: The three-hour Key West Dolphin Watch and Snorkel Cruise whisks you away from the coast on a catamaran to see wild dolphins swimming and playing in the water a few feet from the boat. After watching these gentle mammals, you have a chance to snorkel over a shallow coral reef, which is home to more than 600 different species of marine life. The tour includes snorkel equipment, unlimited sodas, and a professional guide. Islands Boat Tour: If you'd like to explore the islands off the coast of Key West, the Dry Tortugas National Park Day Trip by Catamaran is an excellent option. This full-day adventure on a luxury high-speed catamaran visits Dry Tortugas National Park, where you can explore the military fort, relax on the beautiful beaches, and snorkel along some of Key West's best coral reefs. Included in the tour is an expert naturalist, entrance fees and national park service fees, a narrated tour of Fort Jefferson, breakfast and lunch, and snorkeling equipment. Snorkeling and Kayak Tour: A fantastic way to see the Gulf of Mexico and get up-close to its unique natural habitats is the Key West Island T'ing Sail Snorkel and Kayak Adventure, a six-hour excursion that is sure to please everyone in your group. The tour embarks in the morning on a spacious catamaran, and tourists are provided with breakfast as the boat makes its way to a mangrove island, where you can hop in one of the provided kayaks and explore the truly unique surroundings. The next stop is at a coral reef, where passengers can don snorkeling equipment and be led on a guided tour of the living underwater landscape. Those who prefer to stay dry are welcome to remain in the catamaran and enjoy the sun and beautiful views, and a buffet lunch with beverages is served as well. The Florida Keys: The Florida Keys are by far one of the top places to visit in Florida, best known for their fascinating history and amazing sunsets. Learn about historic forts and tales of pirates, and experience limitless opportunities to encounter wildlife and watch the sun set over the Gulf of Mexico. Sun and Sand: The keys are also naturally home to some of the best beaches in Florida, making the region a very popular resort destination. Key West is home to several excellent resorts, and the popular diving town of Key Largo has a wide variety of resorts as well, ranging from luxury accommodations to private cottages. Mainland Excitement: Approximately 3.5 hours' drive from Key West, the vibrant city of Miami is one of Florida's most exciting tourist destinations, full of attractions and things to do. Tourists can easily add a night or two in the city to their Florida vacation itinerary on the way to or from Key West, or may want to stay a little longer at one of Miami's popular resorts.